Last weekend my nephew picked up a case of apricots from a roadside stand on his way home from college near Sacramento. I turned them into two cases of apricot jam, that now join the case of strawberry jam I made from small Seascape strawberries. I am proud of all my jars lined up on the counter, but that’s nothing compared to how much jam Rachel Saunders makes at Blue Chair Fruit. Rachel worked in restaurants (mostly front of the house) for 10 years as she perfected her jam making skills. In 2008 she launched Blue Chair Fruit. Five minutes after you meet her who realize how serious and passionate she is about jam. When you talk to Rachel you want to make jam and eat jam. You can’t get it out of your head. Rachel and I both believe that jam making shouldn’t be a lost art. It really isn’t difficult and tastes so much better than what you buy in the grocery store. You need to start with good quality fruit, make it in small batches so the flavor stays fresh, and cook it just until it sets. 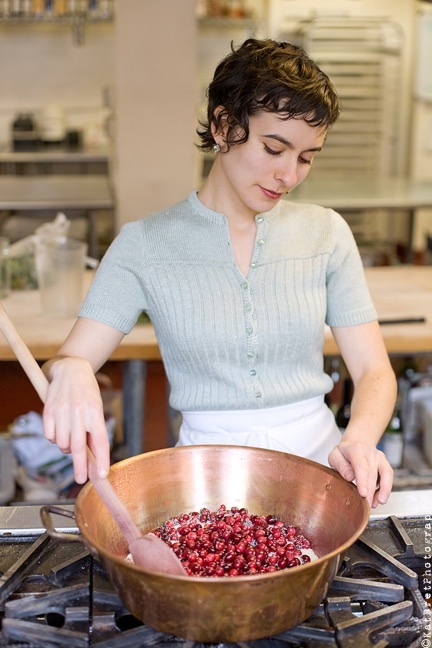 To make her incredible treats she shares kitchen space with Grace Street Catering in Oakland. (This is also the location of the pop up store mentioned in The SF Chronicle a couple of weeks ago.) Rachel, her 6 copper jam kettles, and several assistants transform cases of organic fruit into jars of jams and marmalades. Her suppliers include Blossom Bluff Orchards and Dirty Girl Produce. Last year she made more than 15,000 jars and 90 different kinds of jams and marmalades. This year she hopes to make at least 30,000. If you are impressed with the amount wait until you taste it. It’s amazing. Her flavors vary from year to year depending on fruit availability. In my refrigerator right now I have Concord Grape and Damson Plum Jam, Spiced Bourbon-Tomato Conserve and Black Fig Jam with Almond, Citron and Clove. This year the late rains destroyed a lot of the apricots and cherries so you won’t be seeing as much of these. Jam isn’t just a summertime thing for Rachel. Her favorite jamming season is actually September when the Damson plums arrive but she keeps herself busy in winter too with citrus marmalades. I met Rachel through our mutual book agent. She asked me to write a quote for the back of the book and after reading the galleys I was in jam heaven and had to meet her. When her book comes out in September you can discover her world of jam making. In the meantime you can purchase her jams at various Farmer’s Markets. Better yet, sign up for one of the classes she is offering this summer. You learn not only jam recipes but also the principles behind her craft. And she includes dinner. Go to http://www.bluechairfruit.com/ to find out more details.